Last week, we had a blue moon, which means we had an extra full moon during this season. And as Pixie explained in her newsletter, it's rare. The next one won't be until 2018. Pixie went on to talk about creating a ceremony where you honor nature's magical cycles and the wisdom inside you and create an intention for yourself that you sing to the moon (literally or in a metaphorical way). So I read her words and thought about the kind of ceremony I wanted to create. I love her imagery of the full moon bringing things into the light. But then I didn't set aside the alone time to do it. Summer evenings have a way of getting away from me, and I simply didn't plan well enough to make it happen. However, I found myself awake in the middle of the night with that moon shining in on me. And I started thinking. I started thinking about this place where I'm standing these days with a desire to step onto a larger stage. A desire to expand and create the gatherings and teachings and other good things that support women as they create space for quiet, for stillness, and for joy, as they navigate what it means to really live in the space between the beauty and the mess one move at a time. A desire to dive deep and trust that you will come along. And I started thinking about the longings I have for my own little family, for my day-to-day life. Words like courage and "do it anyway" and listen and softness and "tell it" and "focus in" and "what can you set down?" began to float up around me as the moon was shining in. As I laid there, my head on the pillow, the fan whirring while Jon slept beside me, I tried to just stay in it, breathing, noticing, letting the words and hopes swirl together in a dance and then settle around me. Inhale. Exhale. Trusting the holiness of the moment. Later in the day, I went out to my studio and gathered up visual reminders that represented that dance and put them on my pinboard so I could see them every day, so I could stand tall in this intention and desire. No, it wasn't the ceremony I envisioned at first, but instead it became a powerful declaration of who I am right now and where I want to go all while surrounded by the powerful wisdom and strength of so many of my kindreds. My own peony photo, love note, alchemy card from one of Mindy Tsonas' classes, and the photo Jenna took of my hands holding peony petals at the last retreat. These colors, these women, these hopes, this belief that I can embody the life I want, this is a peek at my heart these days. And I'm putting a note in my Get to Work Book to change this up monthly so I can keep that energy, that inspiration and connection, flowing. Yes yes yes. categories from the studio, yes. flag sets are in the shop! Over Memorial Day weekend, Ellie and I made a set of prayer flags for her room and another set to hang outside on my studio. It was pretty magical! I want to tell the whole story of making them with Ellie in another post soon (it was her first time sewing with a sewing machine! ), but today, I want to share that I had so much fun creating them that I couldn't stop myself from wanting to make more. So I'm having a pre-sale of flag sets in the shop! I've been creating flag sets in various styles for almost 10 years. All my flag sets are inspired by Tibetan Buddhist prayer flags and Apache burden baskets. As I create them, I'm singing away in my studio as I infuse them with love and joy and wishes of light and peace for you. When you hang them inside or outside your home, let them carry your prayers, wishes, burdens, hopes, worries, and deepest dreams and then release them into the world as they blow in the breeze. These flag sets are available just through Thursday of this week! Creating these brings me so much joy, but due to time and other projects, these flags aren't always available in the shop. So if you'd like a set or two, place your order now. They'll come packaged in a sweet little cloth bag ready to give as a gift or hang up in your home. All of my jewelry is meant to be a bit imperfect because it is stamped by hand, but sometimes lockets can get a little "extra" imperfect. This happens because they are vintage and have scratches and dents and spots. It also happens because sometimes my stamp slips when I hammer and a letter is slightly double stamped. I've put these "extra" imperfect lockets on sale in my shop at 40% off! Even in their imperfections, these lockets are all beautiful and hold the mindfulness intentions and love of the full-price lockets in my shop. There are a handful left and you can find them right here. UPDATE: All extra imperfect lockets have sold out. Thank you! I'll have another sale this summer. Sometimes we need a traveling companion to remind us to be present to the beauty and truth that surround us. We need to be reminded to shine a light on what is real, to heal, to dance inside joy. We need to be gently pushed to find our way to laughter and fill the cracks that life creates. We need an invitation to stand tall and give ourselves permission to rest. The Soul Mantra jewelry collection is filled with talismans to carry with you on your journey. When you feel the jewelry resting against your skin or notice it on your dresser before you put it on, give yourself permission to bring awareness to your breathing. Inhale and speak your mantra. Exhale and let whatever you need from the mantra settle over you. I feel so blessed to be sending these talismans into the world. Thank you so much for your continued support. Over here, I'm surrounded by words as I get back into my studio and begin to hammer words of the year into necklaces and bracelets. I love how choosing a word invites us to let go of having resolutions that so often invite in guilt and "not-enoughness." This practice gently pushes me to look forward with self-kindness and think about how I most want the next year to unfold, which is a natural thing to focus on as the calendar changes. As I've mentioned before, as I choose a word, I think about all that could happen in a year, and I want my word to be a companion that brings me back to center amidst whatever beauty and uncertainty await. If you are called to this practice and aren't sure where to begin, here's a link to a post I shared last year that might be helpful to you: A Word to Guide the Way. Along with spending time journaling about my word each month, I'm going to follow along with Ali's One Little Word class this year. I'll be sharing more about my word for 2014, wildness, and why I've chosen it in another post this week. I'll also be sharing a bit about how my word for 2013, water, didn't really "do it for me," and how I let it go months ago and how that felt totally okay. I really continued working with my 2012 word, whole, this year and a few other words. This year, I've added a new Word of the Year design to the shop (that has plenty of space for those longer words) and have added gemstone and bird charm options to the old favorites. The new pewter necklaces are also customizable and there is a pocket talisman option too. Just send over any questions that you have as you look through the shop. I love this time of year, and it feels deeply sacred to me to create these for you. 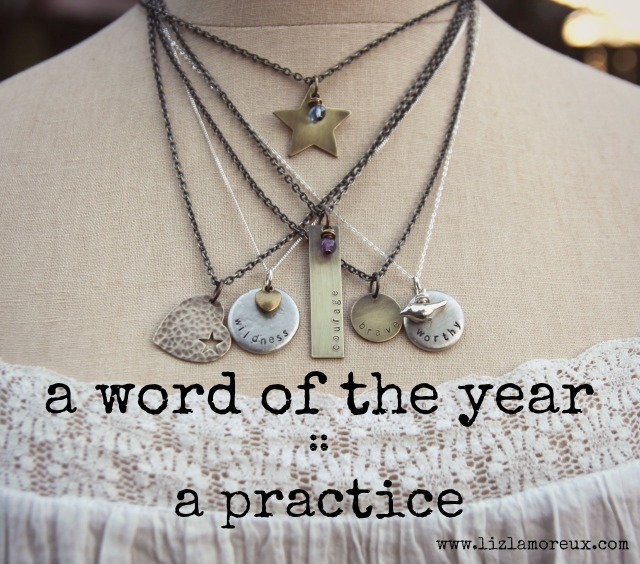 And I really want you to hear me say this: Choosing a word of the year isn't for everyone. In fact, I know it makes some people feel rebellious or even overwhelmed. I'm going to write a post about some other ideas for you later this week, but I do want you to know that I've created something just for you. This little star is for those who don't feel called to choose a word for the year (or can't choose just one), but do feel ready to stand tall in their own light as they walk into a new year. You can add a gemstone to create an intention as well. And the truth is, shining in your own light is really the best intention of all today and every day of the year. And if you are thinking, "Oh please, somebody just give me a word," consider the "Mystery Soul Mantra" necklace. Add a sentence or two with where you are right now on your path in the "Notes to Seller" box over on Etsy, and I'll hold you in my thoughts and heart for a moment, breathe deeply, and choose one for you from my little bowl of Soul Mantras. Thank you for the light you share. So deeply blessed to be doing this work.